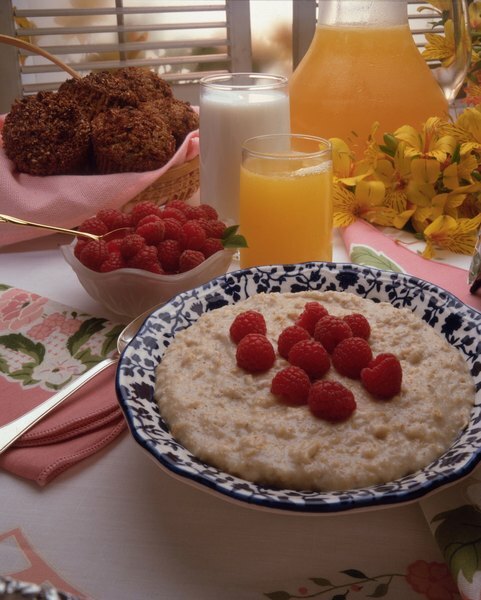 A big bowl of oats keeps your daily fiber intake on track. Although you might get a bit squeamish talking about your body’s digestive system, regular visits to the restroom are just a part of life. Fortunately, fiber can help keep your digestive system in sync by adding bulk to your stool -- making it easier to pass through your internal pipes and maintaining a healthy colon. But fiber has more than just digestive benefits. 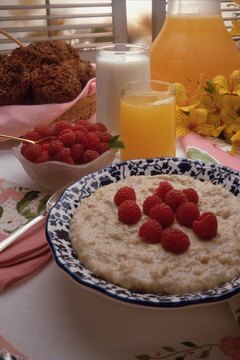 A high-fiber diet also lowers cholesterol levels and maintains healthy blood sugar levels. To ensure that you reap fiber’s rewards, keep your daily intake at or above the recommended level. At age 19, the recommended fiber intake for females drops just slightly to 25 grams per day until the age of 50. However, pregnant women should aim for 28 grams per day and lactating women need 29 grams of fiber daily. The extra fiber helps regulate digestion and keeps an insatiable appetite more satisfied. After age 50, the recommended daily intake for females further decreases to 21 grams. The 38-gram-per-day recommended intake remains the same for males until the age of 50. After age 50, the recommended intake decreases to just 30 grams per day. Rather than just using whole-grain breads in your sandwiches and filling up on fruit, get more creative with your daily fiber. Add spinach leaves and shredded carrots to your whole-wheat sandwiches for an added dose of vitamins A and K. Skip the high-sodium cheese sauce, and instead top your brown rice with garbanzo beans, steamed artichokes and broccoli -- giving you not only fiber but also protein and plenty of vitamins and minerals. 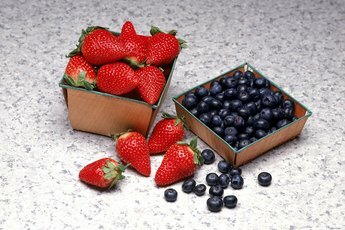 Other high-fiber foods to sneak into your day include raisins, raspberries, whole-wheat pasta, popcorn, peas and potatoes. No specific daily fiber intake has been set for infants from birth to 12 months of age -- they should receive sufficient intake of all nutrients through a regular breast-feeding or iron-fortified formula program. After 12 months of age, a daily fiber intake of 19 grams is needed until a child is 3 years of age. From ages 4 to 8, the recommended daily intake increases to 25 grams. Males need 31 grams of fiber from ages 9 to 13 and 38 grams of fiber from ages 14 to 18. After the age of 9, females need 26 grams of fiber until age 18. Filling a kid’s plate with fiber is surprisingly easy -- and tasty enough that it shouldn’t elicit moans and groans. 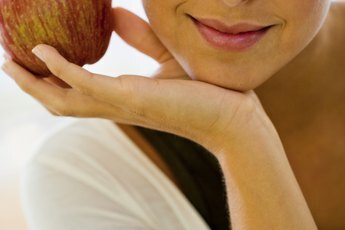 Offer sliced pears and apples as snacks or top a peanut-butter-filled celery stick with raisins for a double dose of fiber. Serve oatmeal with fresh blueberries for breakfast and top a whole-wheat pizza crust with broccoli, artichokes and bell peppers for dinner. Getting too much fiber shouldn’t really hurt you -- but it might cause some uncomfortable symptoms. Since fiber adds bulk to your body’s disposal system, too much of it can cause your intestines to kick into overdrive. Symptoms might include gas, bloating and abdominal cramps. And if you’re not drinking enough water, you might also become constipated. Although fiber is your friend, help flush it through your system by downing at least eight glasses of water per day. U.S. Food and Drug Administration: What does FDA Do? 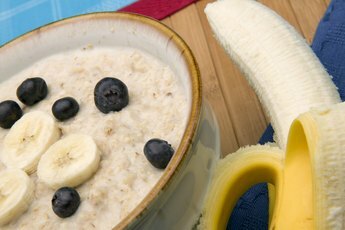 What Are the Health Benefits of Oatmeal for the Immune System?